They’ve been coming fast and fabulous for most of the summer. And now they’re getting close to their last hurrah. Get ‘em while you can. They’re planning their winter vacations now. Precious. Juicy. Jewels. We planted just 4 tomato plants in the backyard, in a raised bed, and we didn’t know what we were doing. We planted them too close. So when they grew (who knew tomato plants like to reach eight feet?) and sprouted millions (I didn’t count, but I think it was millions) of tomatoes, we had a tomato jungle spilling all over itself. We scrambled for makeshift stakes. We criss-crossed with twine & string until we ran out. Then we used shiny pink ribbon (what was in the house). The fence did its part (great lean-to & lean-on). All these partners worked at keeping those prolific tomato plants upright. So we managed. And the funnest part: every day, first thing in the morning, all we wanted to do was look out to see what was going on. These plants-in-a-tomato-jungle were the equivalent of one of those see-through ant farms. The ones where you can watch the ants strolling along the lanes carrying 60 times their body weight in food or building materials. This city of tomatoes was equally busy. Flowering, leaving, pulping up with green toms, turning pink, turning orange, turning red. The endless supply of tomatoes landed in our kitchen. Grape and cherry toms hang out in the plastic colander we used to collect them, and sit on the counter day and night. It’s our candy dish. Two or three are popped in the mouth each time we pass by. Then there are the not actually ruby red ones, sitting on the window sill, waiting for more red. And the bowl of deep red babies ready for slicing, wedging, or whatever we come up with. 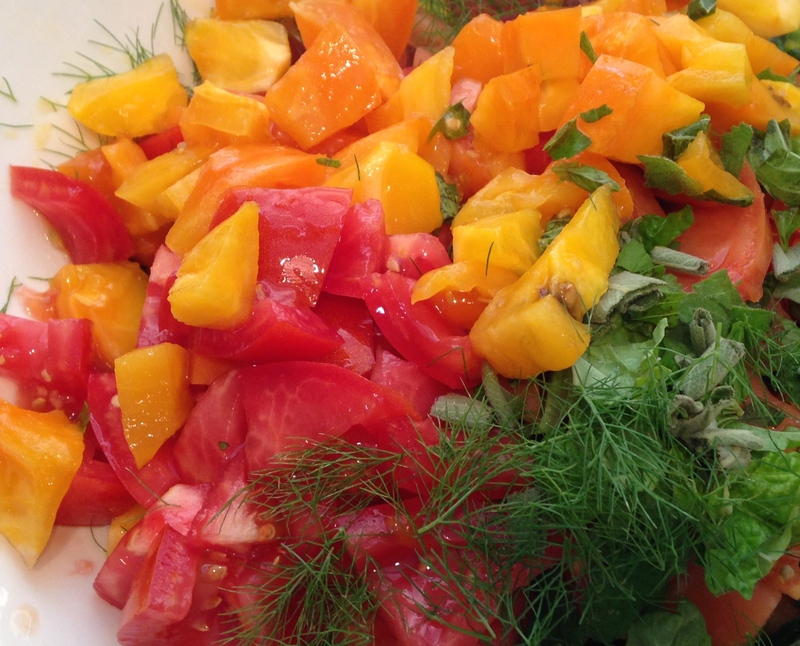 My most favorite recipe for these slicing tomatoes is Tomatoes on Toast. I’ve eaten this toast almost daily since our crop’s been abundant. Toast a slice of your favorite bread. Spread a layer of mayo. Slice your wonderful tomato into thin slices (or thick if you like). Lay them out on the mayo-ed toast. Sprinkle with salt. Using the large holes on a box grater, grate the tomatoes. Just start grating with the whole tomato (opposite end of the stem). The grater will cut through the first skin and then grate the flesh, leaving you with outer skin. Throw away skin. Peel the garlic, smash it flat, add to the grated tomato. Drizzle a little olive oil in tomatoes. Season with salt and pepper. Add the herbs. Let stand for at least 15 minutes for the flavors to combine and add to your favorite pasta. It will be a thin sauce, but the flavor is wonderful. Line a sheet pan with foil. Toss tomatoes and garlic with oil and wine. Season with salt and pepper. Toss with herbs. Roast in oven for about 1/2 hour-40 minutes until tomatoes are tender. Rinse beets of any dirt. Place on a foil-lined baking sheet. Roast for 45 minutes to 1 hour until tender. (Test with a paring knife.) Let beets cool enough so you can handle them. Use a paring knife to peel off skin. Then cut into thin slices. Place beets and tomatoes in a large mixing bowl. Add herbs and walnuts. Drizzle olive oil and vinegar. Season with salt & pepper. Toss gently to combine. Sprinkle goat cheese crumbles. Make the pastry: Add the flour, sugar, & salt to the bowl of food processor. Pulse to combine. Add the butter, pulse until the mixture is crumbly with small chunks of butter. Add wine (or same amount of ice water). Pulse until mixture comes together as a dough. Turn dough out onto a work surface and press together into a thick disk. Wrap in plastic and refrigerate for 30 minutes-1 hour. Meanwhile, salt the tomato slices and let drain in colander for about 1/2 hour. Remove dough from refrigerator. Roll it out on a lightly floured surface to about a 1/8” thick circle. Move to a parchment or silpat-lined sheet pan. Drizzle honey evenly over surface. Place tomato slices in an overlapping circle, filling in the center and leaving about a 2-inch border of dough. Sprinkle with Demerara sugar, and white sugar. Fold in edges of the dough. Brush dough with egg wash. Sprinkle more of both sugars over dough and add the sparkling finishing sugar. Bake for about 35 minutes until golden. When cooled, sprinkle with basil leaves. It’s strange passing by all the tomatoes in the supermarkets — and even farmers’ markets. We don’t need any tomatoes from the store. At least now we don’t. But that will change. I can’t imagine eating any other tomato than the ones coming from the yard. But I know I’ll probably give in to the store-bought by the time we reach December. I hope I don’t forget the difference when I taste a winter tomato. But even if I do forget— the memory will race back next summer. When we plant 4 more (or maybe more) tomato plants. Man, You Are One Cute Tomato! I’ll bet that’s what you’ve been saying all summer every time you’re at the farmer’s market. Or even at the supermarket (I remember in NYC, at summertime, the supermarket would have piles of “Jersey Tomatoes”). I palpitate, almost hyperventilate, when I see those red, pink, yellow beefy or delicate or misshapen tomatoes strewn over the market tables. And then the little pint baskets with mixed grape or cherry tomatoes in red, yellow & green. And the craggy, voluptuous heirloom tomatoes. Edible sculptures just begging for salt and teeth. You can get dizzy-looney coming up with new ways/uses for the beauties. Of course the best is to just bite in and slurp. Go ahead. Nothing like it. 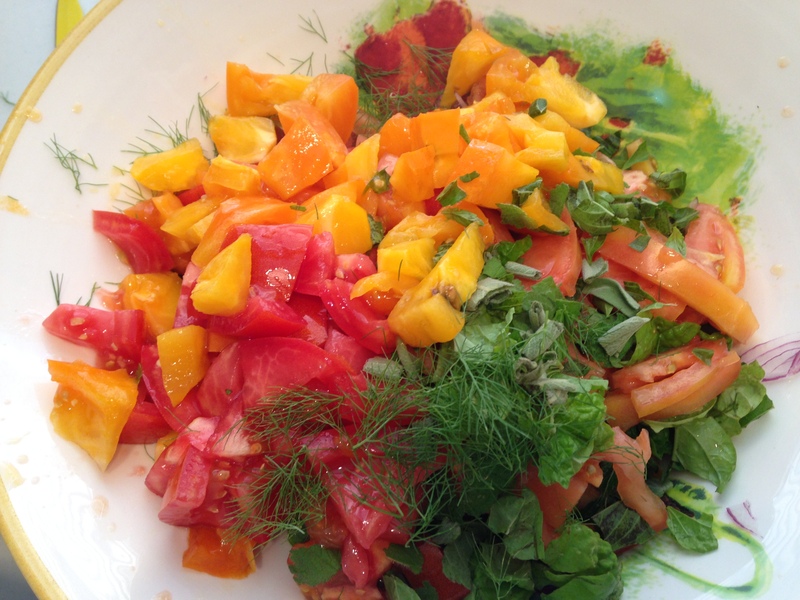 But if you’d like to use a fork and/or knife this gentle salad is like building a pedestal for those queens and kings of summer (are tomatoes male or female– mmmm….??). I cut up a variety of tomatoes into bite-sized pieces. Tear a bunch of fresh mixed herbs. (Try basil, tarragon, mint, parsley, fennel fronds.) Add a drizzle of olive. A drizzle of apple cider vinegar. Season lightly with salt & pepper (lightly because these tomatoes come equipped with giant flavor). Add some crumbled goat cheese on top. (Perhaps a handful of walnuts?) Toss gently. Take the whole serving bowl to your place at the table (preferably outdoors), (bring a fork). Pour a crispy cold little glass of white wine (I’ll take a New Zealand sauvignon blanc). And dive in…to summer in a bowl. To one of the best moments of your life (you’ll thank yourself one cold future winter day). It’s a celebration of you in summer untied with the willing friends of planet earth.